Etoile 1 Tampines 2 | ‘Super Sub’ Steven shows tactical nous in curtain-raiser win | Switch Play! The S.League Charity Shield 2011 was intriguing because of two reasons. First, it was the first ever game on Singapore soil (well astroturf, actually) for the new-look defending league champions Etoile, comprised of almost entirely different players from the ones that lifted the trophy last November. Second, it was the competitive debut of Tampines’ new head coach – and well-liked Malaysia Cup ‘super-sub’ – Steven Tan. In the end, Steven’s substitutions had the desired effect, as Tampines came back from a goal down to win 2-1 with two goals in the last six minutes. Tampines started in a 3-4-2-1 formation, which mirrored the setup they took on in the second half of their recent friendly against Gombak. Shahdan Sulaiman was picked ahead of Shukor Zailan to partner Akihiro Nakamura in a deep midfield position, and the Tampines coaching staff probably felt his technique would allow him to link play with attacking midfielders Ahmad Latiff and Aliff Shahfaein easily, so the four set up in almost a ‘box’ shape in midfield. Etoile, meanwhile, set up shop in a straightforward 4-2-3-1 formation, with the pacey trio of Kevin Lefranc, Maxime Belouet and Stan Fougeround supporting lone striker Jonathan Justin – touted as the “new Freddy Mendy”. Steven’s substitutions – however subtle they might have seemed – actually had lasting implications. When Taufiq Rahmat took the place of the more defensive Zahid Ahmad 10 minutes into the second half, he gave Tampines more pace and energy down the left flank as opposed to the more defensive-minded, older Zahid. Tampines’ superiority down the flanks was amplified when Etoile’s impressive left-back Sirina Camara went off injured in the 65th minute, allowing Imran Sahib to bomb down the right side more effectively. 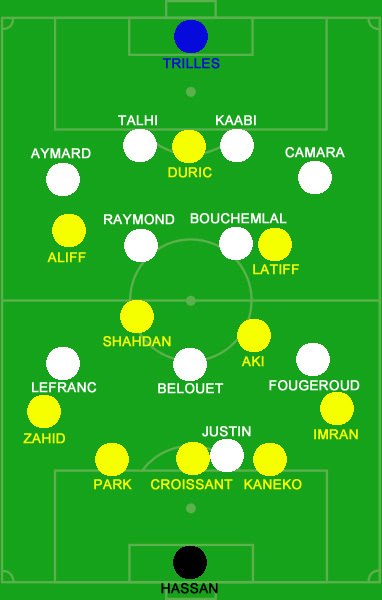 This, coupled with Shahdan being afforded a more advanced role when Shukor came on for the injured Latiff just before the break, meant that Tampines could turn the screws and apply large amounts of pressure on Etoile. The other reason, as explained by Steven himself after the game, was that Tampines knew Etoile were going to tire and sit back towards the end of the game. His third substitution – Jamil Ali on for the ineffective Aliff – was key, as Jamil’s directness saw the Stags equalise through Aleksandar Duric within minutes. Park Yo Seb would stab home the winner in the 89th minute. Like everyone else, I was interested in seeing just how good this new version of Etoile was. While I don’t think the current squad is poor by any means, I don’t think they’re as good as last year’s batch. Even though Etoile wilted towards the end when theyplayed their first game against Beijing Guoan Talent last year, a few players stood out. Mendy glided through the Beijing defence – as he would go on to do plenty of other times against other teams – time and again, Khaled Kharroubi absolutely bossed the midfield, and Flavien Michelini already began showcasing a few of his silky skills. This year’s team had none of that. Despite winning the penalty (which was dodgy anw) Justin did not seem to be in Mendy’s class. This year’s ‘Kharroubi’ – midfielder Hicham Bouchemlal – looks overweight and seems like an anchor in every sense of the word. And while Lefranc, Belouet and Fougeroud were very quick, they did not show too many skills and didn’t really penetrate the Tampines backline effectively. One positive for them is that they seem a very well-drilled outfit, and that’s all the more remarkable considering they had only been training for 13 days. They were also excellent at pressing from the first whistle, which was why Tampines looked so poor in the first half. Their fitness will obviously get better in the coming weeks, so I’m tipping them to be thereabouts in the top four of the S.League this year. Not so smooth sailing for Tampines? Tampines, meanwhile, might be happy with lifting the Shield, but they also have pressing issues to deal with. They looked very very poor in the first half, and although it’s not exactly about the individuals, it was how they did not fit in the system perfectly. While Tampines had Khairul Amri and Qiu Li – current national strikers – to roam behind Duric last year, they now have Latiff, Aliff and Ahmed Fahmie. While I think Latiff is an excellent wide-player, I think he has lost that desire to get among the goals after years of playing as a right winger, midfielder and even defensive midfielder for SAFFC and Woodlands. Aliff is still struggling to bounce back from his prison sentence, and Fahmie is unproven at the S.League level. On Wednesday, they scored only through great awareness by Duric in the box, and through Park after a set-piece was not cleared. I’m still not convinced they are fluid enough in attack at this point, but I hope they can turn it around in the coming weeks and months.